A storyteller and arts educator, she shares a legacy of stories in performance. 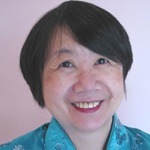 She tells traditional Asian folktales and immigrant history stories to delight and inform audiences of all ages. Her storytelling performances have been featured at various conferences, museums and festivals in Canada. Most recently, she was invited to the Singapore International Storytelling Festival. She grew up in Toronto and studied painting and art history at university. 'All ears' as a child, Bernice heard songs and stories in Cantonese that created a magical world of rich traditions. 'All ears' remembers Chinese elders talking of the railway, the head tax and the struggle to overcome barriers. Stories of Chinese Canadians are called "Gold Mountain Stories" for the gold rush of the 1850s that brought Pacific immigrants to pioneer North America. Fresh from university, Bernice performed as an actor; then co-hosted a CBC radio program. Her 30 years of work in education as a visual artist and storyteller is widely recognized in Ontario. She has made over 900 visits to schools and libraries. She is the recipient of awards from Storytelling Toronto, the Ontario Arts Council and the Canada Council. "The Magic Paint Brush" and other Asian folktales | A selection of traditional tales that resonate with listeners today that include the Autumn Moon Festival, the Lunar New Year and Asian History month. "Ghost Train" and other immigrant history stories | The building of the Canadian Pacific Railway, the Head Tax, and the Chinese Exclusion Act are stories of struggle and determination. Creatures, Big and Small | Surprise, laughter and the chase as animals resolve rights and wrongs. Travel the Silk Road | Journey along the ancient trade route; listen to stories of discovery, science and invention. Three Generations under One Roof | Stories of transformation, old and new world ties are renewed through family relationships. For more information on Bernice's storytelling: Canadian Society of Children's Authors, Illustrators and Performers; Inner City Angels; and Storytelling Toronto.